(I consider this an addendum to my thoughts on the death of the “old” late night television and the departure from late night of my favourite host Craig Ferguson, which I made in December. So read that if you want a full preamble. We live in an age where we have a list for everything. 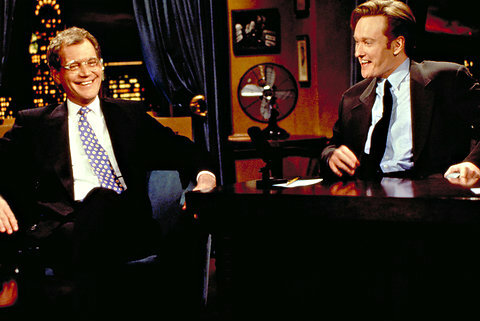 However, David Letterman was doing Top Tens before Top Tens became a well-worn cliché. So we (the “we” in this case is “the Internet”) can be forgiven for all blithely throwing up a Top Ten list to commemorate David Letterman’s 4,263rd episode of Late Show, 6,082nd late night program overall (minus guest hosting duties) and final late night gig of all. AN HONOURABLE MENTION: You’ll note that none of Dave’s more infamously confrontational interviews are included; my humour scale tends not to respond to the embarrasment factor. But it’s worth mentioning that their value was at their highest when Dave either thought the guest took themselves too seriously or he had little respect for the guest’s “accomplishments.” It’s a peek into Letterman’s insight when Paris Hilton told him she didn’t want to talk about her time in jail and how he responded. People (rightly) pilloring Letterman for his faults could produce just as much humour. In the interest of acknowledging there’s a recency bias, I’ll put this on the list but leave it at ten. Late night TV works great when you have some sort of motley combination of folks: having gravelly-voiced Tom Waits as guest with an American mainstream sweetheart, George Clooney, standing by works for this reason, while it also serves the purposes of watching three entertainment vets have a chuckle. Clooney handcuffed himself to Dave in an earlier segment in a gag designed to express his disappointment with Letterman’s retirement (“You’re not going anywhere!”). To their credit, they saw the gag through to the episode’s end. Watching Clooney’s delayed reaction to Waits’ tire business joke tickles my pun-loving funny bone. The first of three ’86 moments on this list, this features one of Letterman’s most celebrated featured players from his NBC days impersonating Dave’s most frequent NBC guest in a bit that demonstrates Dave’s most frequently celebrated quality: the “anti talk show” approach. Chris Elliott pokes fun at all of Jay Leno’s predictable delivery points but Dave is quick to immediately deconstruct the bit on the spot and somehow only adds to its humour. Elliott would return two weeks later with Leno himself to deliver a great callback punchline to the routine. It’s a strange entry for me to put a musical performance on here because a) it’s not Dave doing anything and b) I could really take or leave the Foo Fighters after their first couple of albums (and this was recorded right as their plunge into mediocrity was already in tilt). But anyone that was in high school/college in the late-90s remembers the power-pop-rock perfection that was The Colour and The Shape, and obviously Letterman loved the signature single. Right-wingers say Dave went downhill when “he got political” and believe it or not, I actually agree. Not because of any leanings on my behalf, but because I don’t think Dave did partisan humour well (especially given what his successor was doing in the same timeslot on cable). But what Dave did do well, when he was on, was make fun of the general absurdity of the power politics of everyday life (also see #4). Which is why his takedown of John McCain was a return to form. We’ve probably all been stood up for a false reason at some point in our life (many of us are also probably guilty of same). What’s interesting about this clip is that Dave really gets across over the course of the show how much his initial admiration of McCain informs his disappointment when John bails on him that way. The fact that noted left-wing pundit Keith Olbermann just so happens to be Dave’s substitute for McCain as the Couric interview is unfolding is like an extra layer of delicious wickedness. I wish the whole appearance was on the webs right now but it isn’t. But I’m a big Conan O’Brien fan and anyone born before 1985 probably remembers the reaction to him getting the job to succeed Letterman on NBC’s Late Night: “Who the hell is this guy, why’s he so nervous and when is he going to get funny?” But a lot of our generation thought there was potential, and getting Dave’s blessing was an enormous step forward. Given that Letterman’s production company was already planning a rival program, he didn’t have to do that, but typically Dave wasn’t good at hiding things that he hated– or things he liked. (A lesser remembered appearance is here— with another quick Dave’esque zinger at 0:49 and an oddly prescient statement about Conan’s future). #2 is Dave at his “elder statesmen” best. This is Dave at his “voice of the young comic generation” best. (He was my age at the time, so I may be trying to overinterpret 38 as young– wishful thinking?). Anyone that made a point to stay up to watch the “hip” Letterman probably also considered The Today Show as overhyped anathema and Dave capitalized on it all too well. It’s probably also no coincidence in Dave’s mind that just as NBC would repeat itself in his universe with seemingly absurd TV-think, they would be equally redundant handling their morning flagship. Mix Letterman’s blessing of O’Brien as his successor in #5, his proclivity for poking fun at invisible network bosses in #4/#3 and his sourness at losing his dream job to the comedian cited in #9 and…voila! If you can forgive the excessive Paul Schaffer interventions in this desk bit, you’ll recognize it as a pivotal moment in Dave’s status as late night’s elder statesman. It’s impossible to mention Letterman’s careers without also referencing Jay Leno’s. By all accounts, more people watched Leno and we should like Leno better: a faithful husband with gentle comedy and a kind exterior. Still, there was always something…off…about Jay to those that considered themselves more seasoned comedy fans. You felt like for better or worse, you knew Dave, but you didn’t really know Jay. Dave works that to his advantage here and again does what he does best: deconstruction. The furor over NBC trying to elbow Jay Leno back into 11:35pm, and Leno’s apparent overwillingness to surrender to the corporate structure that drove Dave crazy, kicked off a glorious (if not also redundant) week of high-level Letterman bitching about Jay and NBC. What makes the bit brillant is that Dave doesn’t focus on Jay’s alleged selfishness, he instead focuses on a seemingly innocuous statement (“don’t blame Conan”), dissects its absurdity and divulges what he sees as the personality flaw that informs that statement. Dave would be the cranky old man before and after this, but this was one of the times he was a particularly astute cranky old man. Yes, I’m being ironic by making the number one entry something from the show that got away from Dave…but most times when people praise Letterman, it’s for his anti-humour-humour, his diffusing of normal celebrity sycophantism, general curmudgeonry and his widespread influence. But this is just straight-up clever and funny Dave: bantering with his late-night idol and delivering a hilarious comedy premise that works on YouTube today, worked on television in the 80s and would have easily worked on radio in the 30s (or the stage in any era). Tonight’s Late Show may mark the end of a run for a TV host that was of his time, but there was certainly a spark there that carried beyond his years. I’m sure he’ll enjoy his retirement like anyone of his vintage should: with a big, big bottle of alka seltzer.